Mercedes-Benz Certified, CARFAX 1-Owner, LOW MILES - 12,119! AMG® G 63 trim. 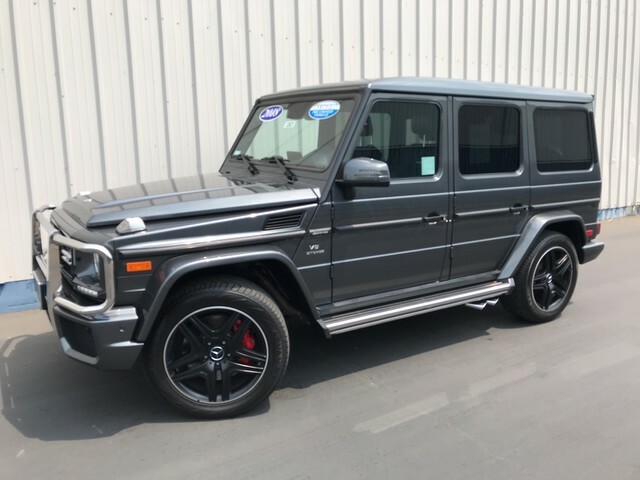 Nav System, Moonroof, Heated Leather Seats, Full-Time All-Wheel Drive, Heated Rear Seat, ALL-SEASON FLOOR MATS, WHEELS: 20 AMG® TWIN 5-SPOKE BLACK. CLICK NOW!======KEY FEATURES INCLUDE: Navigation, Sunroof, Full-Time All-Wheel Drive, Heated Driver Seat, Heated Rear Seat. Leather Seats, MP3 Player, Keyless Entry, Privacy Glass, Child Safety Locks. ======OPTION PACKAGES: WHEELS: 20 AMG® TWIN 5-SPOKE BLACK, ALL-SEASON FLOOR MATS. Mercedes-Benz AMG® G 63 with designo® Graphite Metallic exterior and designo® Black Nappa Leather interior features a 8 Cylinder Engine with 563 HP at 5500 RPM*. ======EXPERTS REPORT: It's extremely quiet on the road. There's minimal wind noise and no road noise. Near total isolation. -Edmunds.com. ======BUY WITH CONFIDENCE: Balance of New Car Warranty plus 1 year/unlimited miles extended Limited Warranty, 24-Hour Roadside Assistance, Carfax Vehicle History Report, NO Deductible, Rigorous Inspection by Factory Certified Technicians, Exchange Privilege for 7 days or 500 miles, whichever comes first, Trip-Interruption Services Pricing analysis performed on 3/22/2019. Horsepower calculations based on trim engine configuration. Please confirm the accuracy of the included equipment by calling us prior to purchase.